We’re pleased to announce support for the line of VBOX camera systems, including HD2, Pro and Lite cameras. How does it work? Just provide power, ground and connect two CAN bus wires to your VBOX system, following RaceLogic’s VBOX wiring for the VBOX Pro , VBOX Lite, and VBOX HD2. 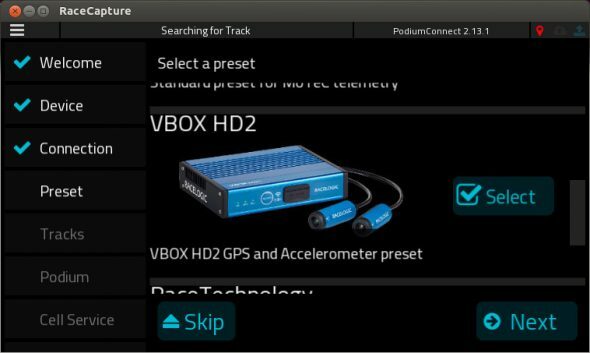 Once you have it connected, just select the VBOX HD2 preset to get GPS and Accelerometer (G-Force) telemetry. The rest of your data can come straight from your ECU and other sensors! For VBOX support, just choose the Generic Harness / Flying Leads option – this harness will connect to the Racelogic RLCAB015L cable assembly for VBOX Pro and HD2. You can still PodiumConnect at a special price from our worldwide dealers or direct from our online store. Pre-orders end Feb 8 2018!